Blanca De La Rosa was born in the Dominican Republic and rose up the ranks of a Fortune 5 company. Having grown up in the projects of New York City, she entered corporate America at a time where there were few role models, and had to learn things her own way, by trial and error. From learning how to beat the odds came her book Empower Yourself for an Amazing Career. It not only describes her own path to success but provides encouragement and advice for Latinas new to the corporate world. Below, in Chapter 1, she explains how one’s career is not a destination but a journey. How do you define career success? Is it becoming a CEO (Chief Executive Officer), making it to middle or senior management, reaching a certain income level, or getting that corner office? If you define career success by your job title, your position within the organization, or where you end up at the end of your career, then you are missing the point of your career experience. Your career is not defined by where you end up; it is not a destination. Your career is a journey that is assessed by your integrity, how you traveled that road, the stops you made along the way, the people you met and inspired to reach their full potential, and the lessons you learned. Those lessons brought you full circle, making you not only the person you are today but also the one you will grow into tomorrow. Your career is a journey defined by your choices, actions, reactions, and inactions in light of the opportunities and challenges life presents to you. I am about to introduce you to an extremely powerful person. This person will be your travel partner, providing all of the guidance and tools you need, along the journey of your career, to empower yourself to transform your job into an amazing career. This person is your inner self. Life is about free will, options, and choices; and no one but you can determine the ultimate path of your career. Ultimately, your accomplishments and the realization of your dreams are up to you, because you can be all that your inner self has in store for you. Only you can access what is inside of you, bring it forward, and make it a reality. Your inner self has the ability to visualize and realize an amazing career, because your true potential far exceeds what you have tapped into so far. You can draw that full potential forward by focusing on your strengths and abilities. Intellectual, academic knowledge can help us up to a certain point by providing information that will help us evaluate different options. However, we always seem to have a need to satisfy our inner voice by making sure that the decisions we make are directly aligned with our inner guidance. When our decisions are not aligned with our inner guidance, we get the nagging voice second-guessing our decisions and motives. As you assess the journey of your career, you will look to various independent sources for guidance: your spouse, friends, family, co-workers, mentors—and even your boss. However, because of their differing backgrounds and life experiences, the advice you receive from each may conflict and be confusing to you as you strive to make informed career decisions. Listen to all of the well-intentioned advice and gauge it with your intuition, your gut feelings. When it is right for you, it will ring true in your heart and your gut. Take what works for you and leave the rest behind. Ultimately, you have to learn to trust your inner self—your inner compass—to help you build a solid foundation for a rewarding career, to help you move through significant transitions and barriers, and to point you in the direction of your next step—the next path that will lead you to that next plateau. As you continue to travel patiently down your chosen path, the road may seem long, winding, and never-ending and realizing your dreams may seem daunting, overwhelming, and, at times, elusive. It may be difficult to remain optimistic when you see no evidence of your dreams coming to fruition. However, you must continue to believe in yourself, regardless of negative circumstances and input from those around you. Your dreams may require time, energy, and other action on your part before they materialize. Stay positive, be optimistic, and keep plugging away at your main goals. Chances are you are doing much better than you think and success is most likely just around the corner. Do not let your boss, your coworkers, or your parents’ or siblings’ negative programming make you lose your self-esteem or self-worth. Unfortunately, whether intentional or not, some relationships shape and ingrain a negative reflection of self into our consciousness through years of disappointments, uncertainties, and doubts. These negative reflections tend to stay with us and develop our overall impression of ourselves and life as a whole, limiting our experiences to what our ego-based fears allow. The ego is shallow and fear-based, and its primary focus is all about “me”. With this ego-based focus, you are bound to fail, making your worst fears come true. Ego-based fears can be extremely powerful and control our minds. If our self-image is threatened, the ego diligently goes to work by partnering with fear to create a pattern of fearful thoughts, perceptions, and ideas. The ego’s role is to help you clearly understand your individual needs, values, and goals in life, constantly reminding you who you are supposed to be. As such, it is constantly evaluating and manipulating fear-based emotions such as inadequacy, humiliation, and failure. These fear-based emotions can drown you in a pool of your own negativity, as your thoughts remind you over and over again of your weaknesses, powerlessness, and hopelessness. It is destructive to indulge in self-pitying thoughts and emotions, so take the time to understand and resolve all insecurities. Stop being your own worst enemy and harshest critic. When you feel inadequate and useless, you sometimes start to attract circumstances, relationships, and situations that affirm that belief. Your body language will confirm your thoughts, and others will perceive your vulnerability and treat you as someone who doesn’t deserve respect and can be pushed around. Replace those old insecurities and fears with new empowering thoughts, and reclaim your self-worth and self-esteem so that you can realize the success you deserve. Learning to accept and re-affirm your position in life and remold your thoughts will end your self-sabotaging behavioral patterns. New, empowering thoughts will yield the benefit of knowing that life has equipped you with everything you need to succeed. Stop looking into the rearview mirror of your life, and leave your hurts and insecurities behind. Look straight ahead with your head held high. Get excited about your goals and where you want to go in your career and life will assert all that you deserve to be and do. Your career should be about growing, expanding your horizons, and surfing on the cutting edge of your industry and environment. While, in the midst of your career, you may arrive at plateaus where you will rest, slowing down and taking it easy as you celebrate your accomplishments and success, but the time will come when you will be ready to move on and do more. For every milestone, you reach in your career; there is always that next level beyond it that will take you to even greater career satisfaction. Sometimes, career satisfaction can be found in mentoring others—in giving back. Take the time to invest in someone else. All it takes is a few minutes of your time to help others navigate their careers. Think of this as helping someone who has stopped to ask you for directions. On the journey of your career, I encourage you to take the time to give back, to “pay it forward,” and to make a positive difference in the life of someone who can learn from your experience. You will be amazed at how it will positively impact your life and your career. True success can at times be defined as having reached back to help others achieve their full potential and career goals. When assessing your career, remember that it is a journey and not a destination; a journey that will be defined by the decisions you made along the way. Your career is a journey; so why not make it an amazing journey worth taking? 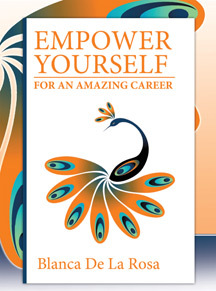 Empower Yourself for an Amazing Career can be ordered directly from the publisher at BalboaPress.com. Twenty-five percent of the proceeds will be donated to the Hispanic Heritage Foundation. Grace Flores-Hughes grew up in Taft, Texas at a time when upward-mobility seemed unlikely for a Mexican-American woman. Yet she went on to get a Harvard education and serve as one of the highest-ranking Hispanics in three Republican administrations, fighting against racial injustice and helping to coin the term Hispanic. Her heartfelt book A Tale of Survival is a quintessentially American story of persevering in the face of adversity and winning against the odds. Below is an excerpt from Chapter 17, in which she recounts being nominated by President Reagan to serve in the Justice Department. Political appointments are basically given to people who helped the president get elected. Schedule C’s are persons that serve the president in the federal government in capacities ranging from mid-level assistants to high-level deputy assistant secretaries. Presidential appointees serve in sub cabinet level positions and require Senate confirmation; if confirmed, they earn the title “Honorable” for life. That may be about the only perk associated with a presidential appointment; everything else about it is hard fought and can be risky. Even some of the best people will be dragged through the mud—Supreme Court Justice Clarence Thomas is one such example. So when I learned that Gil had passed away my mind turned to his successor. Gil’s body hadn’t even made it out of cold storage and all I could think of was how to get named to his post. I was sad that my old friend had died, but at the same time I felt compelled to rush to the head of the line and throw my name in for consideration, knowing that every Hispanic who had ever dropped as little as a dollar into the president’s campaign would throw their name in the ring. Of course, others eager to serve would do the same. Presidential appointments are few and not easy to come by. The director of the Community Relations Service could be highly visible, depending on who held the post and how much support the White House lent the occupant. It had two missions: to resolve conflicts related to race and ethnicity and to resettle Haitians and Cubans fleeing from their countries into this America. Even though I liked my work at the SBA, the mission of CRS intrigued me, plus this was my chance to become a presidential appointee, a level in government I had never thought would be within my reach. A few days after Gil’s funeral, I called a friend in the White House personnel office about the CRS position. Over lunch, we further discussed my interest in the post. But as our conversation moved along, my friend insisted that the job required someone with a law enforcement background, since its primary mission was to end riots resulting from racial/ethnic conflicts. But after much deliberation, I convinced her that a person with a lengthy career in management made more sense to be appointed as the next CRS Director and she pressed on with my name to the powers that be in the White House. I recognized it was a long shot for me to get the post. First, I would have to be interviewed by one or more members of the White House personnel staff. If I made that first cut, the attorney general’s top staff would interview me and if I made that cut, then the attorney general himself would interview me. During that interview process the FBI and other investigative agencies would vet me before President Reagan would even think of nominating me for the position. After the vetting, should any embarrassing issues in my background crop up, they could very well derail my nomination. After all the investigations are complete, my name would be sent to the Senate Judiciary Committee for further review and a vote. If the Judiciary Committee voted in the affirmative, my name would be forwarded to the full Senate for a final vote and confirmation. A short time later, I received a call from the Justice Department to meet with the deputy attorney general, Arnold (Arnie) Burns. When I arrived at the main Justice building on Constitution Avenue, I thought back to the day I had stood in the attorney general’s conference room so frightened I could barely speak. This time was different. Yet, when I entered Burns’ conference room I was surprised at the number of people in the room. I took a seat alongside Burns on a large leather couch while a number of his assistants occupied seats around a conference table while others stood in different places throughout the room. Before I had a chance to catch my breath one question after another popped from every direction in the room. From the manner in which they were questioning me, I felt as though I was up for the most important job in the world. A few days after that rather spirited, hair-raising interview, I was called by a Justice Department secretary to return for yet another interview. This time, the interview was with the Justice Department’s number three man, Brad Reynolds. Reynolds was considered one of the most conservative members of the president’s administration. I called every conservative friend to prepare for my interview. They all had more or less the same response. “He’s a most intense fellow. Watch out for him. If he smells that you aren’t a true conservative, you won’t get the job,” they warned. Reynolds occupied what had once been the office of the legendary late FBI Director J. Edgar Hoover. It was an especially well-lighted and spacious office. When I announced myself to one of Reynolds’s secretaries, I found John F. Kennedy, Jr., sitting at a small, corner desk, clipping newspaper articles. While I sat waiting for Reynolds to meet with me, one of his secretaries introduced me to the young Kennedy, who was interning during the summer. John was polite and gracious. I couldn’t imagine a Kennedy working alongside Reynolds. Those two were as far apart in their political philosophies as Kennedy’s father was from Richard Nixon when they ran against each other in 1960. But it struck me that there was much for them to learn from each other and I was more than pleased to see that happening between a Democrat and a Republican in the supposedly non political Department of Justice. It took a long time for Reynolds to break away from his other meeting, allowing me time to observe the late President Kennedy’s son at his work. He was tall, but seemed much slimmer than I expected. He was the kind of handsome that took your breath away. His face was almost perfectly chiseled. It did strike me, though, that while his Kennedy relatives had that toothy smile and blond Irish look, he didn’t much resemble them. He was, in a category all of his own. My meeting with Brad Reynolds didn’t last long. While he made small talk and asked a question or two about my knowledge of the CRS, he never once cracked a smile. His intensity unnerved me. What if I got the CRS post? Would I be able to survive such an intense and serious man? After ending our meeting, the tall, lanky Reynolds stood up from his desk and walked me out of his office. I thought about all those other interviews where I was ushered out the door before I had a chance to bat an eye and I figured the result of this meeting would be the same. But to my surprise, a few days later, I received a call from a member of the attorney general’s staff to schedule a meeting between Attorney General Ed Meese and me. I had read a lot about Ed Meese in the press. He was in the news as the counselor to President Reagan during his first term. When I interviewed with Meese in the summer of 1987, he was still making news, but that had more to do with his involvement in the Iran-Contra affair and other domestic issues. During his early days in Washington, Ed Meese had made some remarks along the lines of “we’ve got to be meaner than junkyard dogs.” The media seized on his comment and by the time they got through writing about him, it seemed Meese himself was meaner than a junkyard dog and no one else. Yet during my interview, Meese was cordial and nothing like the press played him out to be. It probably didn’t hurt that a letter on my behalf from his old California friend, Charles Wick, was sitting on his desk. Our meeting lasted longer than I had expected, yet I left his office not sure he was going to hire me. A few days later my friend at the White House called and said my name was sitting on the president’s desk waiting for his approval. During our conversation I took the chance to suggest that the president announce my nomination during Hispanic Heritage Week. The White House announced the president’s intent to nominate me in the Rose Garden during Hispanic Heritage Week in September 1987. It was intent to nominate, not nominate, because I hadn’t been thoroughly vetted in time for the president to make the announcement. During the Hispanic heritage ceremony, I stood alongside President Reagan and Vice President Bush and some other key members of the administration. As I faced the rolling television cameras and heard President Reagan announce his intent to nominate me, I thought about my days in Taft. I thought about my school friends who had influenced my life and I thought about my friends from West Pecan Street who also influenced my life, in yet another way. But mostly I thought about how proud Amagrande would have been to see me on stage with the head of el gobierno of the United States that she so proudly hailed yet feared. I realized the position to which I was being nominated by President Reagan wasn’t the end all of political appointments. But having reached the assistant attorney general level after starting as a GS-2, was for me the pinnacle of success. 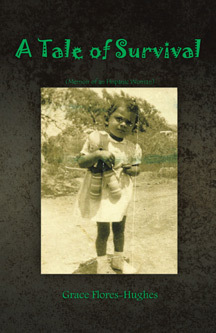 A Tale of Survival can be ordered through the author’s website at GraceFlores-Hughes.com, BarnesandNoble.com, or Amazon.com.